All bunches include Helium , ribbons of your choice , and a table weight of your choice. Bunches will be bagged for you to take away. 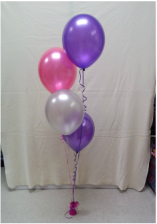 You can choose your colours ( and design if having printed balloons) and we use pearl finish latex balloons . treating ( to last several days ) cost 90p extra but cannot be done if having a double bubble. Choose the age and colour of 11inch latex balloon inside.